If you haven't installed any of the Office apps on your iPhone or iPad as yet, download one, or all of them from the Apple App Store. Once you download it, tap any Office app to open it. Swipe through the introduction, and tap Sign In. 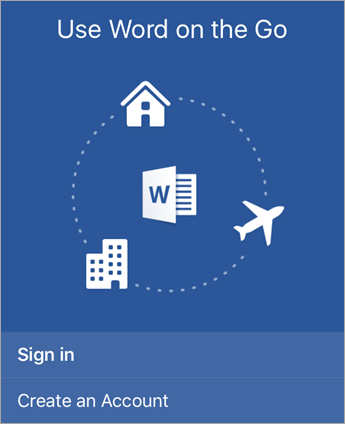 To use the extra features in the app, on the Sign in page, type the personal Microsoft account or work or school account associated with your Office 365 subscription, and then tap Next. Note: To troubleshoot sign in issues, see What you can do in the Office apps on an iOS or Android device with an Office 365 plan. 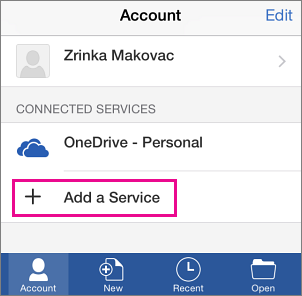 After you complete the sign in process on one of the Office apps, your account and the OneDrive for Business service is automatically added to the other Office apps installed on your iPhone or iPad. Tap the service where you want to view your files. For example, to view Word, Excel, or PowerPoint documents, tap Open > OneDrive - Personal or tap Open > OneDrive - your business name and you'll see the list of files you saved to OneDrive or OneDrive for Business. The files you see are specific to the app you opened them in. For example, if you opened the Word app, you'll only see Word documents or if you opened the Excel app, you'll see Excel spreadsheets. 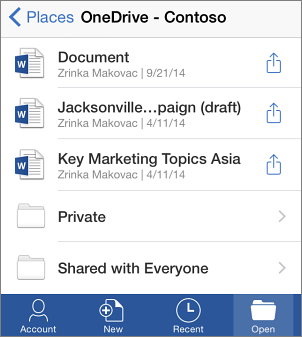 If you installed any Office app on your iPhone or iPad, but set it up with a personal account, for example a Microsoft account like your outlook.com account, you can also add your work or school account to access the work documents you saved in OneDrive for Business, SharePoint team sites, or document libraries. Note: What work documents you can edit depends if you have a qualifying Office 365 for business or education subscription and if you have an Office license assigned. See What you can do in the Office apps on an iOS or Android device with an Office 365 plan. Open Word, Excel, PowerPoint, or OneNote on your iPhone or iPad. In Word, Excel, or PowerPoint, tap Account, and then tap Add a Service. If you're using OneNote, tap Settings > Accounts. Tap OneDrive for Business. Type your work or school account, and then tap Sign in. The service is now added to your account. Tip: After you complete the sign in process on one of the Office apps, your account and the OneDrive for Business service is automatically added to the other Office apps installed on your iPhone or iPad. From the Word, Excel, or PowerPoint app, open or create a document and tap AutoSave > Help and Support. In OneNote, tap Settings > Help. Or, select a link in the table below to view the help in a web browser. Your device must be running iOS 8.0 or later. Important: To use the extra features in the apps, you must sign in with the Microsoft account or work or school account that's associated with your qualifying Office 365 subscription. If you have an iPad Pro, you must also have a qualifying plan to do any type of editing on that particular device. See What you can do in the Office apps on an iOS or Android device with an Office 365 plan. To learn more about Office apps on the iPad Pro, see the Office blog post Microsoft Office apps are ready for the iPad Pro.